Throughout history opposing factions, whether in politics, racial campaigns, sports competitions or even wars, have used cartoons as a medium to promote their side and to denigrate the opposition. Nowhere was this better seen than during WWII when both sides used thousands of derogatory cartoons to depict the ‘enemy’. But one of the most humorous incidents occurred much earlier, during the Napoleonic war between France and England. It allegedly took place in the little town of Hartlepool on the north-east coast of England. As part of the propaganda campaign in England during this war the enemy, the French, had been portrayed as short and hairy, sort of monkey-like. The cartoon below will give you the idea. Also, during the Napoleonic Wars there was great fear that the French had plans to invade Britain and therefore much public concern about the possibility of French infiltrators and spies. As a consequence the fishermen of Hartlepool kept a close watch on French vessels sailing near the English coast. One day, as they watched, a French vessel was seen struggling against a storm. It took a severe battering in the rough seas and eventually sunk. The Hartlepool fishermen then turned their attention to the wreckage washed ashore. Among the wreckage lay one wet and sorrowful looking survivor. It was the ship’s pet monkey and, to amuse the sailors, it had been dressed in a military style uniform. Stupid individuals are one thing, annoying but they can be handled. Group stupidity on the other hand is extremely dangerous. The stupidity level seems to increase by at least ten times the number of morons gathered together. I’m sure there’s a mathematical formula for this, there should be. So, severely intellectually challenged, and thinking they had captured the enemy, the Hartlepool fishermen apparently questioned the monkey and held a beach-based trial. 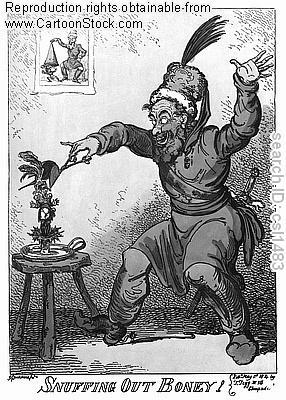 Unfamiliar with what a Frenchman looked like, and unable to understand what he (the monkey) was saying (presumably “ooh ooh aah”, as opposed to “oh la la”), they came to the conclusion that this poor primate was a French spy. 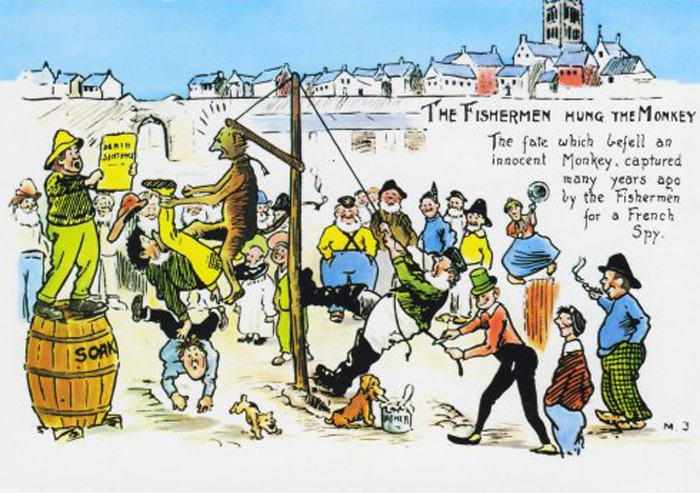 They quickly sentenced the French spy (monkey) to death and the unfortunate creature was hanged, with the mast of a fishing boat (a coble) providing a convenient gallows. A very strange case of mistaken identity indeed! Most of the time, about 90 percent, in this blob we look at stupid humans and the various ways we interact with them and they themselves interact with society. Sometimes these incidents have involved animals and other species. But animals and the rest can be dumb in their own right and do dumb things. If Bill had just gone to the Wabash River in Indiana he might have been a lot more successful with his catch! Have a look at the video and you’ll see what I mean. The last couple of blog post have concerned people featured in the Darwin Awards, “Never Hitch Your Wagon” about someone who wasn’t eligible because he survived his and his wife’s stupidity, and “Little Dumb And Large Dumber” because their dumbness did make them successful Darwin Award winners. I had a friend who almost featured in the Darwin Awards too. The only reason he didn’t was because they didn’t exist in those days and probably none of us would have had the presence of mind to nominate him anyway. I won’t tell you his real name, have to expose the innocent and protect the guilty and all that, but his nickname was “Goners” pronounced “Gone-ers”. It was a nickname he gained after the incident I am now going to tell you about, and for most of his friends he’s still stuck with it to this day. It happened when we were all young guys, in our teens and spending a leisurely summer messing around and generally enjoying life the way you can before you get older and wiser and burden yourself with responsibilities and debt and so forth. Then the Dads were paying the mortgage and bringing home the bacon (sometimes literally) and we were carefree and happy. This day we decided to go for a walk along a nearby river. None of us were keen fishermen but we liked the river and walks along the riverbanks and the little stony beaches that the river’s meanders had left here and there. That particular summer was hot and a bit of bathing in the cool clear unpolluted water was also on the agenda. It wasn’t a big river, no Amazon that’s for sure. Just about 50 feet across, or thereabouts, and maybe four or five feet deep towards the middle. There were a few deeper holes that serious fishermen tended to use, but we were always content messing around in the shallower water. It was fun and safe. In fact thinking and writing about it, I wish I was back there right now. But I’m not, so on with the story. Part of the river bank was relatively flat with only a slightly sloping bank down to the water. Other parts were a straight drop. And yet others consisted of a fairly steep slope down to the water’s edge. Local farmers had dug drains at intervals to let rainwater run off their fields into the river, and between where the man-made drains ended and the river began, the water flow had over the years dug its own ‘V’ and then ‘U’ type trenches by eroding the top soil. These had to be negotiated when one was walking along the riverbank, but it wasn’t a problem. That was how things were and everybody just accepted it and got on with it. I’m sure nowadays there would be a bureaucratic do-gooding group wanting all sorts of rules and regulations both to disrupt the farmer’s lives and to spoil the nature walk for the rest of us. In those days some interfering busybody was more likely to end up in the river and they knew it so they stayed away. Of course, when I said the drains weren’t a problem, what I meant was they weren’t a problem for most of the people most of the time. But there’s always one idiot who will find a way to mess up even a nice summer’s day stroll along the riverbank. Enter “Goners” into the story. Although the day I am recounting was idyllic weather wise, during the previous night there had been a thunderstorm and some furious rain for a little while. The result of that was that the following morning there was considerable run-off of rainwater from the fields, via the farmer’s drains into the river. This made the areas close to the drains a little wet and slippery, not to mention mucky. We had been walking for a few miles, successfully crossing all the open drains we had encountered. And then it happened! “Goners” tripped or lost is concentration or something, but his balance went and he headed over the side of the riverbank. At first this caused unbridled hilarity amongst the rest of us. We were laughing and pointing and cheering. If we had had pens and paper with us, no doubt we would have held up makeshift score cards critiquing the ‘dive’. But we hadn’t so we just laughed and laughed, not only at the dive but at the frantic wriggling and gurgling of “Goners” in the trench. “How can you drown in three inches of water?”, came a chorus of incredulous replies. “Goners” was in BIG trouble. He WAS actually drowning in probably less then three inches of water. “Goners” had fallen into the drain nature had made with the water erosion. Obviously he didn’t intend to, and, unprepared, he fell head first, with his arms by his sides, as opposed to being in a normal diving position with his arms outstretched in front of him and slightly raised. As he had slid down the riverbank towards the water he had embedded himself farther and farther into the drain, trapping his arms by his side. And when he reached the water, which was indeed barely three inches deep at the edge, his face including his nose and mouth were submerged under the level of the water. The frantic wriggling wasn’t just to try to free his arms, but to try to get his mouth and nose out of the water to grab some much needed air. And he clearly wasn’t having much success. Once we realized that he was in real trouble, of course it was all hands on deck so to speak and everyone rushed to his assistance. Two of us each grabbed one of his feet and pulled him back up the bank a little so that his head came out of the water. Much to his relief, and ours, “Goners” made a few huge grabs for air and the crisis seemed to be over. Now I don’t know to this day whether what happened next was a deliberate act, something sub-conscious, or just another minor accident, but with his movement and gasping for air his feet, which like the rest of him were slippery with the muck from the drain, managed to slip out of our hands and he slid back into the water again. Gurgle, gurgle, wriggle, splutter, gurgle…. We knew he was in no danger this time and yes, we did laugh again. It was funny for everyone but “Goners”. Some of us – not me you understand, no definitely not me, of course not, don’t be silly, how could you think such a thing – could have played that game all day, pulling him out of the river and then letting him slide back in. Thinking about it now, we probably invented a new water-boarding technique, to us at the time it was just fun. But we must have thought better of it after a couple of ‘dunks’ because the we pulled “Goners” out of the drain completely and back up on to dry land. And that was his nickname for ever more, “Goners”. It shows you just how easily and innocently things can happen that under different circumstances would have had a lot more tragic results. Strangely enough, many years later, in the very same river as it happens, a guy called Willy (the same as featured in my blog post “Willy And Woof”) did the very same thing while walking back home from a bar, very, very drunk. That time however there was no one around to help. Now he could have been a Darwin Award winner! I did a bit of hunting when I was a kid and it was enjoyable enough at the time. And I have nothing very much against it for those who are inclined to such pastimes. But as I got older I lost interest in it. If there’s vermin around I’ll take out my shotgun and dispatch it no problem. But these days, and you may agree with this or not, I find that there are much more interesting things to do that trying to outwit a duck. The same can not be said for these two intrepid hunters. The story begins with a guy in Michigan, USA, who bought a brand new $30,000 Grand Cherokee, on credit naturally. He was very proud of his new rig, and got hold of his friend to do some male bonding with the new ride. They decided to go duck hunting on a frozen lake and turned up with their guns, a dog, lots of beer and of course the new vehicle. They drove out onto the ice. Now, they needed to make a hole in the ice to attract ducks – something for the decoys to float on. In order to make a hole large enough to interest a flock of ducks, they needed to use something a bit bigger than your normal ice drill. 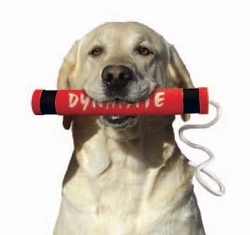 But, thinking ahead and coming prepared, they had brought with them a stick of dynamite with a 40-second fuse. You can probably see where this is going already? To their credit, these guys realized that they wanted the explosion to be far away from themselves, the jeep and their equipment. However, they also didn’t want to light the fuse and run back to the jeep in case they slipped on the ice. So far so good, and the logic of their thinking was okay. Their solution, however, was to stay where they were, light the dynamite and then throw it as far as they could. Again so far so good, it still sounded like a plan. So they did that very thing. They threw the dynamite and the explosive landed a suitable distance away. They waited for the explosion. However, when they made their plan they had no contingencies in it about their dog. A well-trained golden Labrador, it immediately set out across the ice to bring the back the stick. That’s what dogs do. And this dog did. The two would-be hunters started yelling, stomping, and waving their arms. The dog glanced back but took all the frantic activity as approval and encouragement and happily ran back toward the hunters, fizzing stick of dynamite firmly clenched in it’s jaws. As the dog approached, one of the pair thought rapidly, grabbed his shotgun, and shot the dog. Unfortunately the shotgun was loaded with #8 duck shot and was hardly effective enough to stop a dog the size of a Labrador. The dog did pause for a moment, slightly confused, but then continued on. This time the dog became really confused and, quite naturally, scared. He changed direction, and now with an extremely short fuse still burning, headed for the nearest and indeed only cover on the wide expanse of ice. Yeah, underneath the guy’s brand new Cherokee. The dynamite went off, and dog and jeep plummeted to the bottom of the lake. Strangely, the insurance company refused to pay up. I know this blog is all about highlighting stupid rules and regulations and the even stupider people who are put in place to enforce them. Similarly with bureaucrats and bureaucracy. The blog is called FASAB because we, as reasonably normal and sane individuals should Fight Against Stupidity And Bureaucracy wherever and whenever we see and experience it, not just timidly accept it. Very serious message, just trying to illustrate it in a humorous way where possible. As in everything there are degrees of this stupidity. There are people who dress rather stupidly as in yesterday’s blog. Or people who do stupid things when they are working or just going about their normal lives. That’s the acceptable face of stupidity. It entertains us rather than angers us, although it can be a bit frustrating at times too. The really dangerous fools are the ones who have been placed in positions, usually in government and local government positions, or in banks or large companies we have to interact with, who have no ability intellectually but who have been handed the ability to mess with our lives. These are the people that we should not bow down to, that we should not tolerate and who we should expose, ridicule and fight against wherever and whenever we find them. Then there are those from the former group, who are prone to do stupid things, but who are smart enough to realize that maybe they can make a bit of a living out of their mishaps. One such person is a guy from Tennessee called Bill Dance. If you haven’t heard of Bill, he is a retired professional tournament angler and nowadays hosts a reasonably successful TV show about fishing called Bill Dance Outdoors. Each episode is about half an hour long and is a mixture of illustrating various fishing techniques, product advertising, and tips and tricks. Sometimes Bill has celebrities like Terry Bradshaw, Hank Williams, Jr., Mel Tillis, Jerry Reed, or others along with him. If you are into fishing then you should give it a look, its now on Versus in the US (formerly the Outdoor Life Network. Now I know some of you are thinking this fishing talk is boring. What has it got to do with a blog like this? Yes, I know where you’re coming from. I am not a fanatical fisherman and never have been. I think I was put off the sport at a very early age when I went fishing with a complete idiot who proceeded to hook the back of my shirt when he was casting his line and dragged me backwards into a lake. Although, as I’ve gotten older, it does have a greater appeal. As long as you were idiot free what a nice relaxing way to spend the afternoon, maybe writing an entry for your blog??? But whatever your views on fishing, Bill is a great illustration of the group we talked about at the beginning, people who are stupid, but harmless (except to themselves), and who consistently do stupid things that serve to entertain rather than annoy. Have you had similar experiences? Send them along. Let the world know what is happening before it is too late.